I seem to be stuck on art this month. Obviously, I need to get out more. 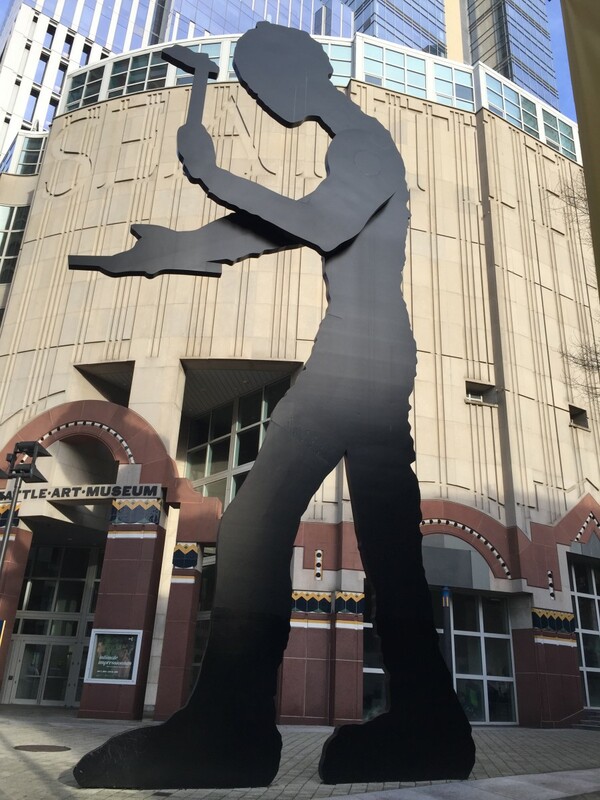 Hammering Man by Jonathan Borofsky, owned by the City of Seattle, stands outside the entrance to the Seattle Art Museum. Although you can’t tell from this photo, Hammering Man lifts his hammer and brings it down about 2.5 times per minute. The sculpture, which is 48 feet tall and weighs about 22,000 pounds, honors hard-working men and women. Hammering Man was originally installed outside the museum on September 28, 1991. However, during the installation process a lift strap broke. The resulting damage was severe enough that the sculpture had to be shipped for repairs back across country to the foundry in Connecticut where it had been made. The sculpture was successfully installed a year later, in September 1992. 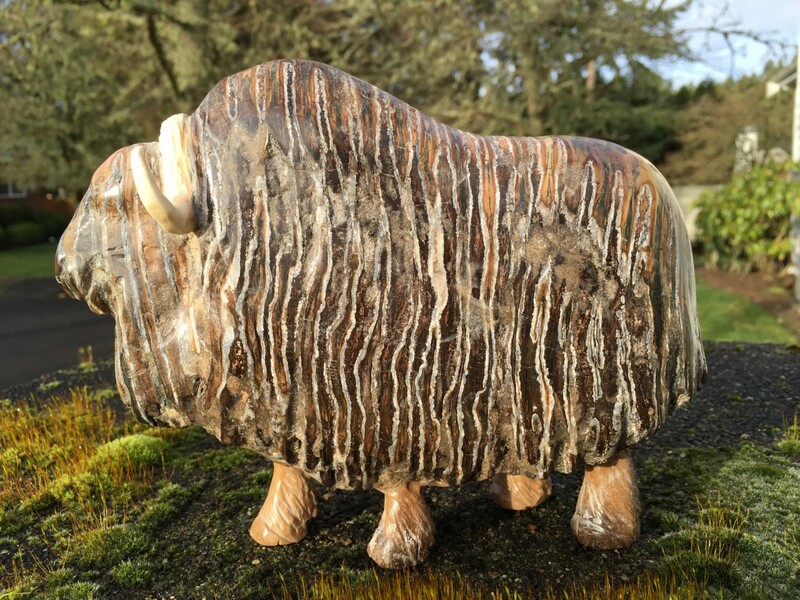 This is a muskox carved out of a mammoth tooth by Fairbanks, Alaska, artist Chuck Leake. I fell in love with the muskox—live ones—several years ago when we first visited Point Defiance Zoo & Aquarium here in Tacoma, WA. Both my husband and I were immediately drawn to Leake’s creation as soon as we saw it in a shop in Homer, AK. Leake says that the best mammoth teeth come from the permafrost in remote northern villages. He must seal each tooth and let it dry for at least six months before carving it. It just fascinates me how much the striations on the mammoth tooth resemble the coloring of a live muskox’s shaggy coat. I am in awe of artists who can look at a block of marble or a mammoth tooth and see a sculpture waiting to emerge. 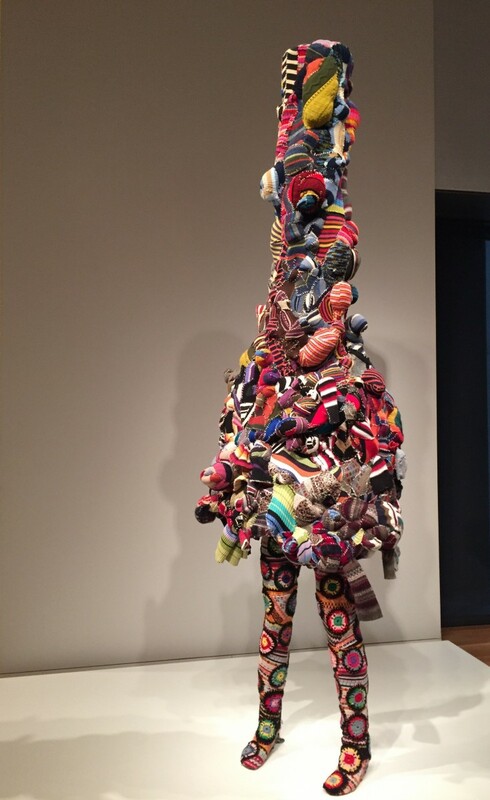 Soundsuit (2006) by Nick Cave (American, born 1961), made of knitted wool and synthetic yarn sweaters and crocheted afghan squares. Currently at the Seattle Art Museum. I work with objects that are taken for granted or laughed at or deemed less precious, yet have a certain significance in themselves. great art choices, thanks for sharing them, they made me happy too!